On Oct 9th 1935 an Inaugural Meeting was held in the Oddfellows Arms to form a Bowling Club at Thornaby Village Recreation ground. It was decided to proceed with the proposal with an initial membership of 33 with annual subscriptions set at 5 shillings each (25p). Early in 2005, Freddy Watton (on the left), the most senior member of the club sadly passed away. 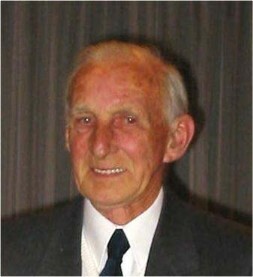 Throughout his 53 years as a member of the club, he never lost his enthusiam for the club or indeed, for the game of bowls. In 1969, the Ladies Section was formed. Their first general meeting was held in the Cocktail lounge at Thornaby Indoor Bowling Club with 19 Ladies attending and several others sending apologies. Initially, the total membership was 30. For the first four years the Ladies played friendly matches against other clubs and in Club Competitions. By 1973 the Ladies felt ready to participate in league matches and were admitted to the Teesside Ladies league. At this time the format was four rinks of triples and changed later to the current format of three rinks of four players. 1984 saw the demolition of the old wooden clubhouse by the local council, who provided a more modern brick building for the members. The club was considerably weakened in Sept. 1988 when 10 members left the Village Club to form a new club at Teesdale Park, Thornaby.